Unicorn Valentines – So Easy To Make! 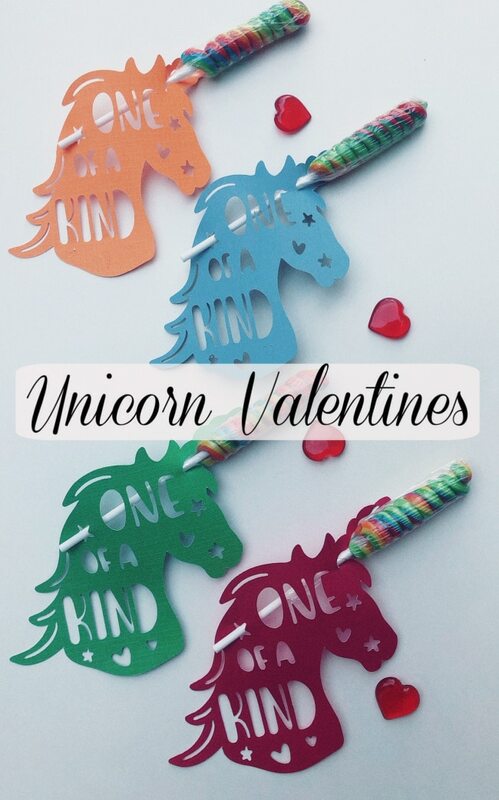 These Unicorn Valentines are some of the simplest Valentines I have done for the kids, but they will be popular this year – with the popularity of Unicorns right now. Seriously, it was cut and slip the lollipop through and you’re done! 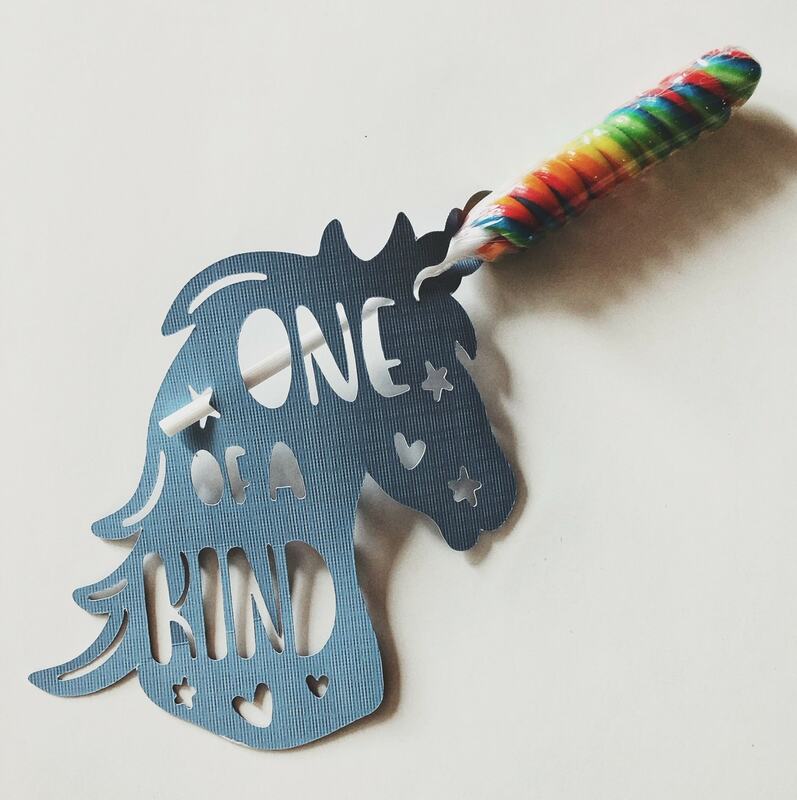 All we did was cut out this cute unicorn heads on our Cricut (but you could use any Unicorn, and we have some more ideas below), and then threaded through one of these spiral lollipops that we picked up at our local store, for the horn. 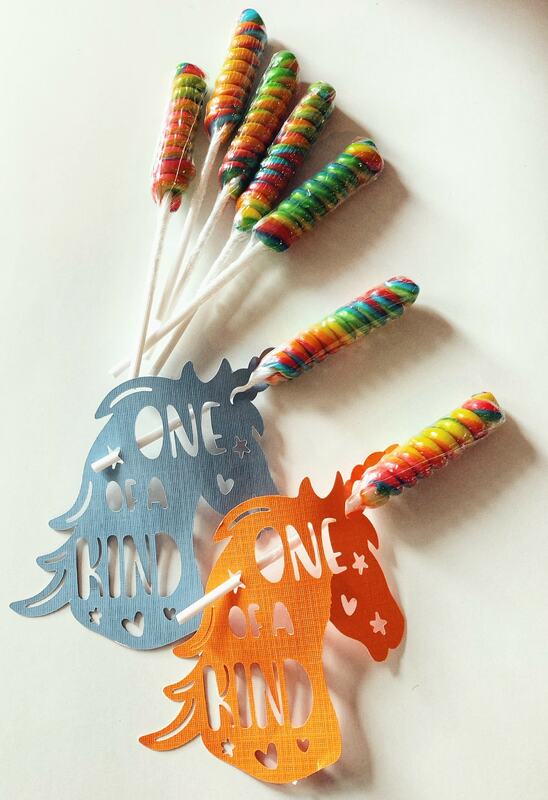 I chose rainbow colored lollipops, so we could make the unicorns in all sorts of colors, and kids could pick their favorite color. We made ours for a school party, but you could use them for your child’s valentine cards to hand out to their class too. Spiral lollipops to act as the Unicorn horn. Unicorn head cut outs. I made mine on my Cricut using this design with the ‘One of a Kind’ cut out. I sized it to 4.581 by 5.594 if you want to use the same size I show in the images here. If you are using this design, I simply threaded the lollipop stick through the slit in the horn, and the star that is between the “o’s” on the left top side of the Unicorn. There are many other Unicorn designs in Design Space for Cricut users, but I kept it simple with this one. You can also search for free printable unicorns online if you do not have a cutting machine list a Cricut, and print and cut those out by hand. Here are some ideas here. 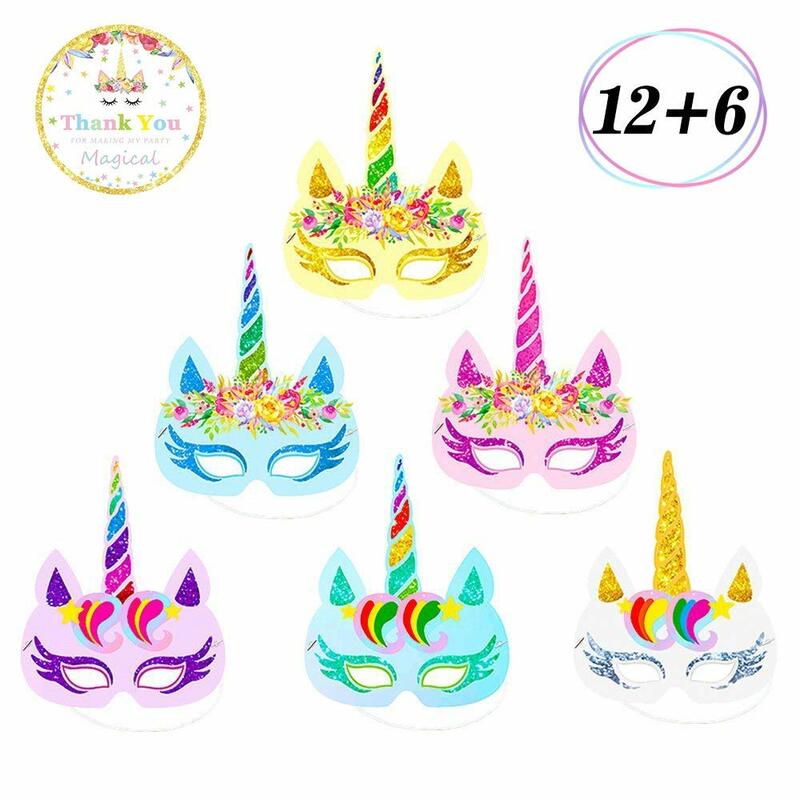 If you do not want to deal with cutting out the unicorns, you can order these fun Unicorn face masks, and use a hole punch to punch two holes you could thread the lollipops through for the horns. These are so easy to make. Start by either cutting out the Unicorn shape per the specifications above, or purchase your unicorn head. 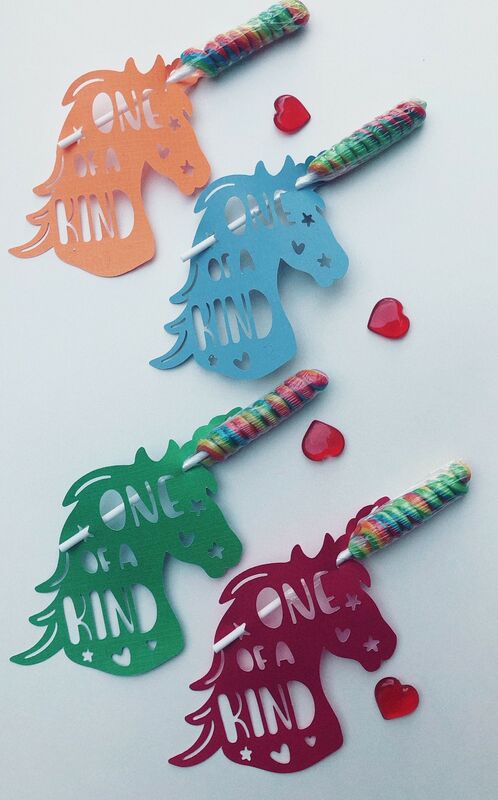 Once you have either cut or purchased your unicorn faces, then you can use a hole punch to cut two small holes that you can thread the lollipop stick through. You can also tape it on the back, but I found the easiest method for me was to thread the stick through the holes (this is because the lollipops are heavy compared to the paper, so the tape tended to want to pull off. A couple of things to keep in mind here. You will want to align the sucker with the unicorn horn (as it is giving you a 3-d horn for your paper cut out). So, if you are using a design like mine above, then you will want to align the horn on the slant, and cut your two holes so that the lollipop will align with the horns direction. Since my print out has words and stars in it, I just found two spots I could thread it through with no additional hole cutting needed. If you are using a design that has the horn going straight up and down (like the masks above) that is pretty straight forward, and you just stick the lollipop straight up over that horn. 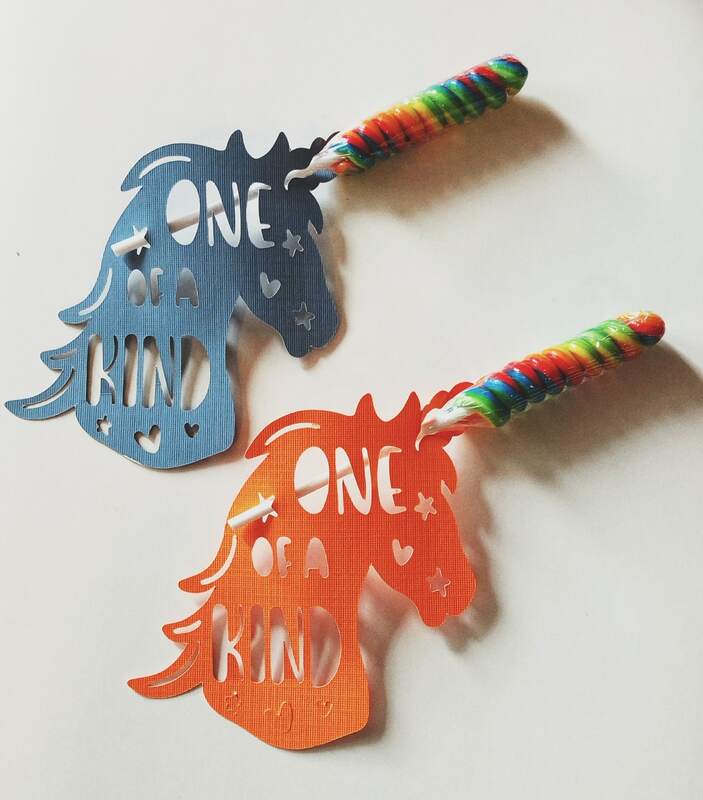 We are passing ours out generically, but you could add the child’s name to the front or the back of the unicorn if you want them personalized. 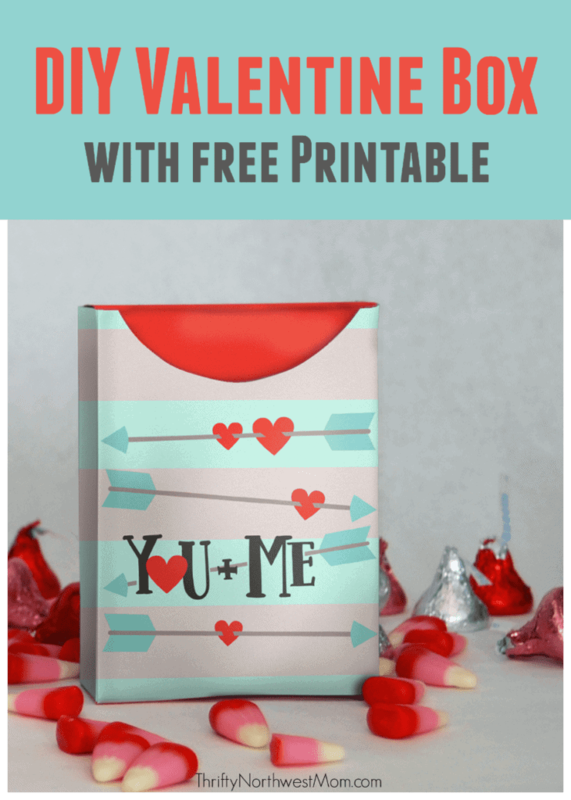 These are some of the simplest DIY Valentines I have made, and I cannot wait to pass them out to the kids. For more DIY Valentines Ideas, visit our Valentine’s Day Project page here.